We all hate wasted bird feed, all those little bits that spill out of hanging feeders onto the ground, or the excess waste of crumbles or pellets lost from a ground feeder due to scratching hens. There is a cost to this wasted food, especially when you run out a week sooner than expected, and have to get a fresh new bag of feed early! Another MPC employee recently shared her version of homemade chicken feeders, so here’s mine! I decided to create a DIY PVC chicken feeder, too. In fact, I made two! And they have a small footprint, so they work well in small run or small coops without taking up a bunch of space. Easy, dry access to feed with less waste. I’ve tried different commercial feeders over the years, but my girls were wasteful with all of them. Finally, I put my foot down and created a new DIY PVC chicken feeder design that would hold a good amount of chicken feed they can reach with their beaks, and NOT with their feet! Plus, they take up very little floor space so they’d be great in a small coop. As you can see, I added walk boards over the pipes to keep the food dry since mine are set up in the run. It also helps so the birds don’t crowd the feeders. 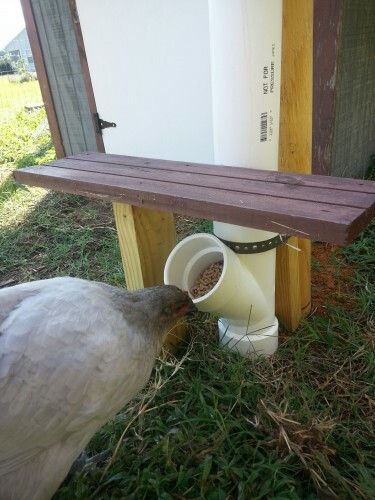 Simple and effective: the DIY PVC chicken feeder. It’s a simple design. 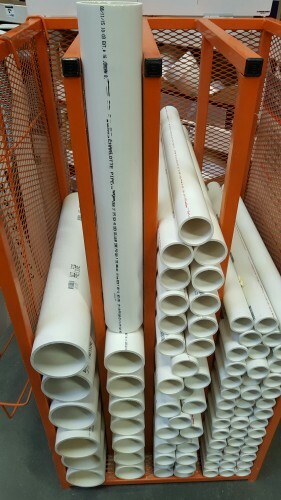 You can cut the PVC to size, or they will even cut it for you at some locations. I didn’t need to cut anything to make these, which is great for the person who shouldn’t be using, or even have, power tools. My cost was about $13 each to make, but your costs will vary depending on exactly how you make them. For instance, you can make your feeder as tall or as short as you like. Mine are 3′ tall and strapped to the posts of our run. I used 3″ pvc (these items are available in 4″ if you’ve like yours wider). With the 3″ wide I can have 2-3 hens with their heads in the feeder at a time. If you use a 4″ wide instead 3-4 chickens can happily eat from each feeder at the same time. 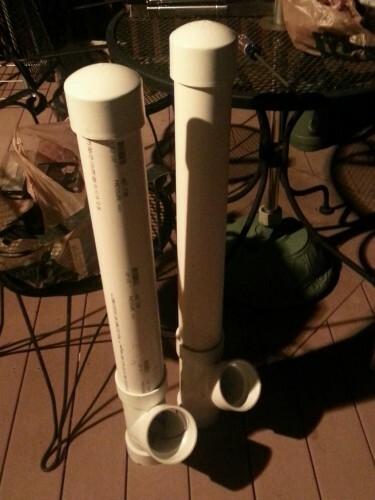 *First, you’ll need a 3″ or 4″ PVC pipe, at the length you prefer. 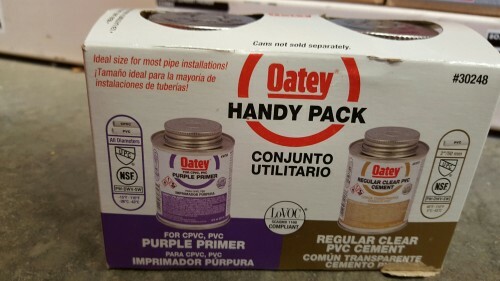 Epoxy plumbers’ pack. Pick one you are comfortable using. 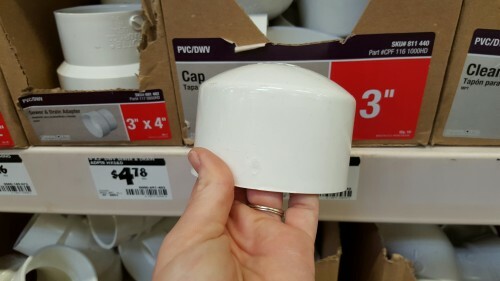 Cut your PVC to size length you would like (again, some hardware stores will make the cut for you). 2′-4′ should be good for most people–remember, you need to make sure they’re easy to fill! Add epoxy around the end of the pvc you are going to insert into the Wye pvc pipe. Make sure the epoxy is also applied inside the Wye pipe so they bind together. Please read safety directions on the epoxy product you choose first. Allow to dry. Add epoxy around the PVC Cleanout cap where the threads are only, and epoxy around interior bottom hole of the Wye pipe. Your Wye pipe side joint should be facing up and out on the side (the opening should not be facing down). Push together and allow to dry. This is to keep the food from falling out the bottom. Work quickly as this epoxy dries very quickly. 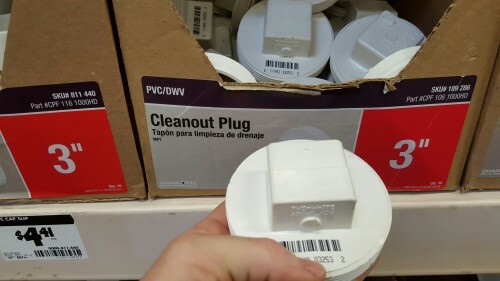 The Hub or Socket cap will fit on the top of your PVC pipe where you fill with food. No need to epoxy, this part will come on and off with each food filling, but is there to keep the contents of your feeder dry. The feeder fits nicely between the coop and the run so eveyone has access. At this point you may strap your feeder in place where you would have easy access to the tubes in your run or coop. 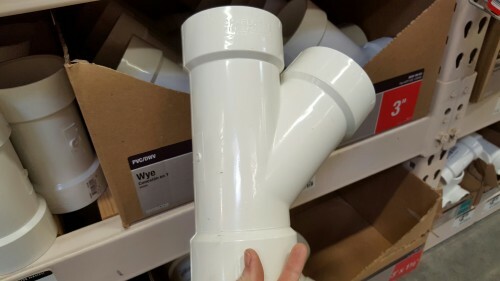 Because you can cut the PVC pipe to any length you can work these into any area that is easy for you to access and fill as needed, and unlike large feeders that sit on the floor of the coop or run, these don’t take up space. 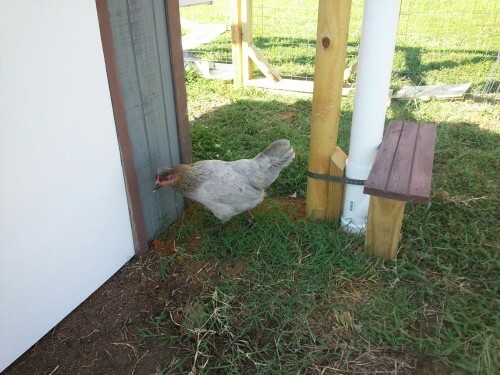 Do you have a custom creation for your coop for a feeder or waterer that meets your chickens’ needs that you just couldn’t find out there on the market? « Molting Season or Exploding Chickens? Hope this will work for my free range chickens. Thanks!